Tarp or poly? Read this to decide. Pops open instantly into shape - no assembly required! Can be used indoors or outdoors. If using outdoors, place a groundsheet under it.Poly floor; 100% polyester mesh (~1200 holes per inch will also protect against bedbugs and no-see-ums); Over-sized door; Fiberglass poles.The tent is shipped 3-folded in a 26 inch disc. Please take a tape measure and visualize the size before you buy it. The 26 inch disc will NOT fit in your luggage.Weighs only 2.1 lbs! Length: 86 inches (usable length: 6 feet), Width: 39 inches, Height: 35 inches.PLEASE CAREFULLY WATCH THE DEMO VIDEOS ON THE SANSBUG WEBSITE BEFORE FOLDING IT - the poles will splinter if incorrectly folded! Folding should take seconds once you get the hang of it but you DO need to watch the demo video SEVERAL times. Pops open instantly into shape - no assembly required! Can be used indoors or outdoors. 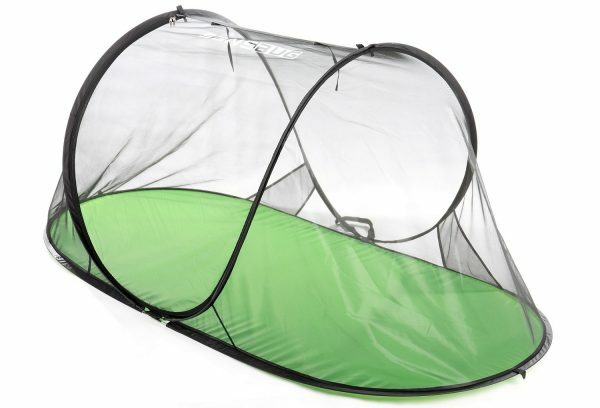 If using outdoors, place a groundsheet under it.Poly floor (same material as the roof so there's no crinkly noise like in the version with the heavier tarp-like floor); 100% polyester mesh (~1200 holes per inch will also protect against bedbugs and no-see-ums); Fiberglass poles.The tent is shipped 3-folded in a 26 inch disc. Please take a tape measure and visualize the size before you buy it. The 26 inch disc will NOT fit in your luggage.Weighs only 2.2 lbs! Length: 86 inches (usable length: 6 feet), Width: 39 inches, Height: 35 inches.PLEASE CAREFULLY WATCH THE DEMO VIDEOS ON THE SANSBUG WEBSITE BEFORE FOLDING IT - the poles will splinter if incorrectly folded! Folding should take seconds once you get the hang of it but you DO need to watch the demo video SEVERAL times. Pops open instantly into shape - no assembly required! 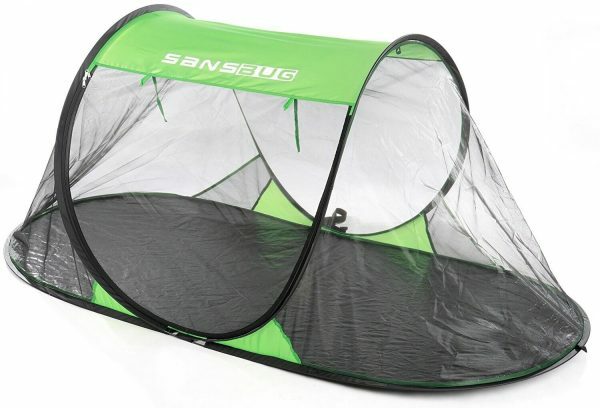 Can be used indoors or outdoors.Tarp floor; 100% polyester mesh (~1200 holes per inch will also protect against bedbugs and no-see-ums); Fiberglass poles.The tent is shipped 3-folded in a 26 inch disc. Please take a tape measure and visualize the size before you buy it. The 26 inch disc will NOT fit in your luggage.Weighs only 2.5 lbs! Length: 86 inches (usable length: 6 feet), Width: 39 inches, Height: 35 inches.PLEASE CAREFULLY WATCH THE DEMO VIDEOS ON THE SANSBUG WEBSITE BEFORE FOLDING IT - the poles will splinter if incorrectly folded! Folding should take seconds once you get the hang of it but you DO need to watch the demo video SEVERAL times. Pops open instantly into shape - no assembly required! 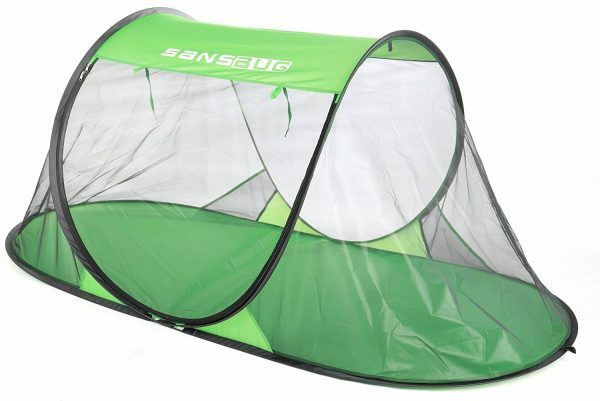 PLEASE CAREFULLY WATCH THE DEMO VIDEOS ON THE SANSBUG WEBSITE BEFORE FOLDING IT - the poles will splinter if incorrectly folded! Folding should take seconds once you get the hang of it but you DO need to watch the demo video SEVERAL times.The tent is shipped tri-folded in a 31 inch disc which is more than 2.5 feet wide! It will NOT fit in your luggage.Weighs only 3.5 lbs! Folds into a thin disc, only about 1 inch thick.Length: 8 feet, Width: 4.75 feet, Height: 3.25 feet.Tarp floor; 100% polyester mesh (~1200 holes per inch will also protect against bedbugs and no-see-ums); Fiberglass poles. Pops open instantly into shape - no assembly required! PLEASE CAREFULLY WATCH THE DEMO VIDEOS ON THE SANSBUG WEBSITE BEFORE FOLDING IT - the poles will splinter if incorrectly folded! Folding should take seconds once you get the hang of it but you DO need to watch the demo video SEVERAL times.The tent is shipped tri-folded in a 34 inch disc which is almost 3 feet wide! It will NOT fit in your luggage.Weighs only 4.5 lbs! Folds into a thin disc, only about 1 inch thick.Length: 8 feet, Width: 5.8 feet, Height: 3.6 feet. Two doors.Tarp floor; 100% polyester mesh (~1200 holes per inch will also protect against no-see-ums); Fiberglass poles.